Flamingoes, vibrantly hued and long-legged have always been popular in pop art and now with so many designers borrowing from art to add quirkiness to everything from accessories to home decor, you see these pink birds everywhere! & now I am more than excited and content about the photographs I got to click of them. Though I wager I might still go back to Ameenpur Lake to get better shots! Not quite common knowledge, the Ameenpur Lake in Hyderabad is an expansive lake of over 100 acres, right in the backyard of one of the Industrial Areas in the city. Though more than half of it has dried up – the lake bed is chock full with shells, clearly once part of the lake itself – it still holds its ground as an important wetland area and a safe haven for migratory and local birds alike. 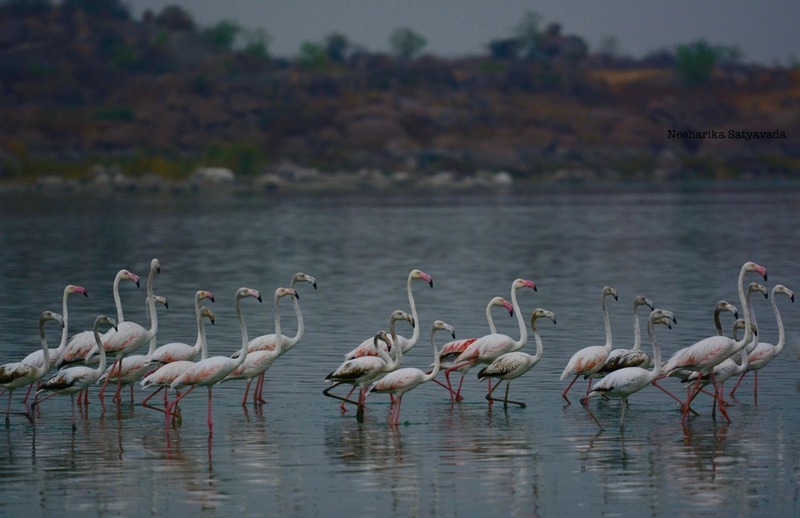 This lake was recently adopted by the Telangana State Special Protection Force and the State Government is working towards declaring it a Heritage Biodiversity Park and has granted funds towards restoring it. Getting There: It is just off the IDA Bollarum Road, between Miyapur & Bachupally. Use Google Maps to guide you there, besides on a weekend you can always follow the trail of vehicles heading in that direction once you are on that road. Remember: Be there at the lake early in the morning. The locals say the flamingoes leave by around 10 in the morning and are back only in the evening. I am yet to go there later in the day though, so I am not too sure about this. Read Next: Its a small, small world. I have been Flamingo Festival at Sulurpet, Andhra. I love this bird to the core. I adore its unity. Flamingo festival generally happens at the last week of January or first week of february. It was just amazing Neeharika. Love the way the local people come together towards the conservation of this adorable species. The Flamingo Festival usually happens for 3 days around the second weekend of January, at least that was the case last year and this, when it was held around 9 -10th. True the locals are very aware and helpful. Who would have thought one can find these beautiful birds so near to the city! !